Autonomous cars are an inevitability, which we’ve known for a while, but the remaining questions we’ve had for a while doesn’t concern the technology, but rather the regulations. Rather than wait for the government to say something, it looks like manufacturers are just saying “screw it” and stepping up to the plate themselves. It looks like every major auto manufacturer, and quite a few tech companies, have their own autonomous vehicle programs in the works. Some of the leaders in the field include Volvo, Mercedes, and Google, which all have their examples playing in the streets. And the robo-cars actually have a pretty impressive track record. 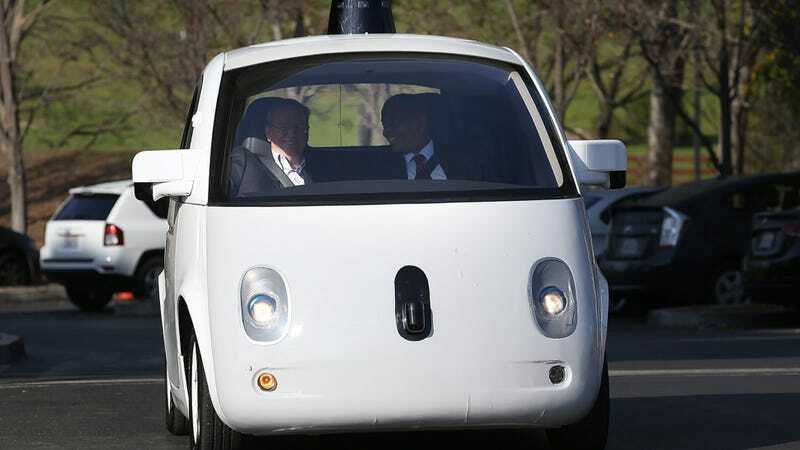 With Google’s cars, for instance, for every incident they’ve been in, not once has the autonomous car been at fault. But that doesn’t mean it’s a physical impossibility that a self-driving car could ever be at fault, in a universe full of whimsical happenings. As it stands, most states and the federal government don’t really have a legal framework for who would be responsible in a totally hypothetical situation in which a generic autonomous vehicle plunks the head off of a child. Would the occupants of the car be at fault? Would it be the manufacturer of the car be the one who bears responsibility, as they designed the car and all of its systems and software? A lot of manufacturers aren’t saying much for now, possibly waiting and hoping and praying that the government will say something, anything about that sort of situation. But since our government is dysfunctional and the likelihood of it doing anything at all is virtually nil, companies are actually standing up and saying they would take the blame themselves, if for nothing else to get the ball rolling. Google and Mercedes told us, if their technology is at fault once it becomes commercially available, they’ll accept responsibility and liability. But all involved expect fewer crashes as the technology evolves. Mr Samuelsson will address a select audience at a seminar entitled “A Future with Self Driving Cars – Is it Safe?” at the House of Sweden in Washington DC, during which he will emphasize that the introduction of self-driving cars on the world’s roads will happen more quickly than many lawmakers anticipated. He will urge regulators to work closely with car makers to solve controversial outstanding issues such as questions over legal liability in the event that a self-driving car is involved in a crash or hacked by a criminal third party. Mr Samuelsson will clearly state Volvo’s position on both of these contentious issues. He will say Volvo will accept full liability whenever one if its cars is in autonomous mode, making it one of the first car makers in the world to make such a promise. He will add that Volvo regards the hacking of a car as a criminal offense. That doesn’t mean you’ll be able to direct your robo-car to engage in a spot of child-head-plunking, mind you, just that companies have thought about it. So don’t get any ideas. Contact the author at ballaban@jalopnik.com. What the Hell Is This Oddball Mercedes Mule?